Toroi Sokomanu's side got their first win of the campaign. last weekend after beating Spirit 08 2-1. The first goal came from a young Imere's striker, Silas Frank. and went in to the Blue's net. Malapa converted a penalty to give them the victory. watch. He worked hard with the ball and made a good shot in the end". give their support to us", said a happy Sokomanu. 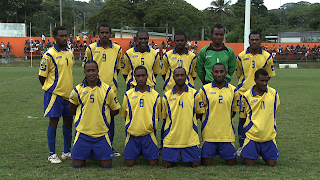 Masauvakalo with Amical F.C. and Seule Soromon in New Zealand.